The homepage features a new illustration drawn by CLAMP. You can watch a teaser trailer on the website as well. The movie opens June 2nd, 2012 on Japanese theaters. is that saya and solomon? The blond guy is Fumito. OMG I cannot wait~! The movie looks so AWESOME! *Kamui Santa is back!!! * Loved the new illustration and the trailer, it looks promising. Despite the use of the Youth Ordinance Bill to enforce curfews for minors and regulate the use of the internet, young people continue to fight for their own freedom through underground methods. One such group calls themselves Surat. They have decided to take on Fumito Nanahara, a man who has great influence on the political world, and basically controls Tokyo with an iron fist. While using the internet as a weapon to discover more information about Fumito, they learn about “Tower”, the secret organization behind Fumito which engages in human experimentation. When members of Surat attempt to set up an ambush in the subway to expose the truth behind “Tower”, mysterious creatures suddenly appear and attack the passengers. 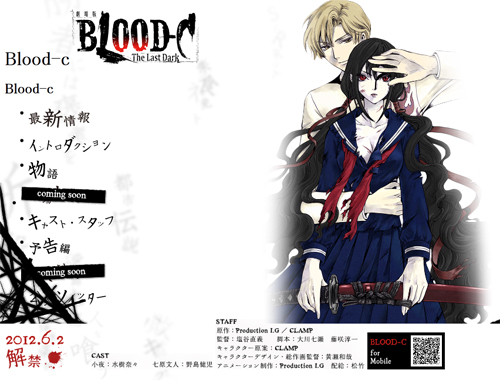 During this crisis, Saya appears – a young girl who uses a Japanese blade to slay the Old Ones. The same Saya who lost everything dear to her in that horrifying incident in Ukishima Province. What sort of “experiment” is Fumito and “Tower” trying to conduct using the Old Ones? And can Saya finally deliver vengeance to Fumito?